Safety at road construction zones is everyone’s responsibility. As a driver, here’s what you can do to contribute. Road construction zones are extremely common in high traffic areas. 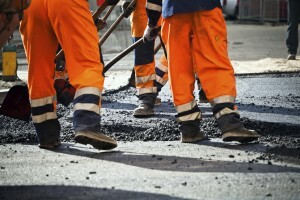 Over time, a concrete or asphalt road will need some kind of repair. In order to keep you, your passengers, pedestrians, and construction workers safe, you need to be mindful of a few critical things. Here is a brief list of safety tips for driving safely through road construction zones! When driving It is always a good idea to keep a safe distance from the driver in front of you. This will give you time to break if you need to come to an abrupt stop. When you are passing through a road construction zone, it is also in your best interest to increase your driving distance to give yourself even more time to react if something happens in front of your car. When you are passing through a road construction zone, you are best off cutting out any distractions that could put you in harm’s way. For instance, loud music and phone calls should be put on hold until you have safely passed through the construction area. Whenever you pass through a road construction zone, you should always be on the lookout for construction workers. While they are almost always dressed in high-visibility clothing, they are often walking around large pieces of machinery or behind buildings. For that reason, you always need to assume that people are around you, which is another reason to always drive cautiously in these zones. This should go without saying, but it is important to note that it is critical that drivers always obey the commands of the flaggers at a road construction site. It is important to realize that these individuals understand what lies ahead and know how you need to drive through the area. If they are telling you to stop because other cars are coming through or there is something hazardous ahead at the moment. This entry was posted on Friday, March 22nd, 2019	at 6:03 pm	and is filed under Construction Zones	. You can follow any responses to this entry through the RSS 2.0	feed. Both comments and pings are currently closed.